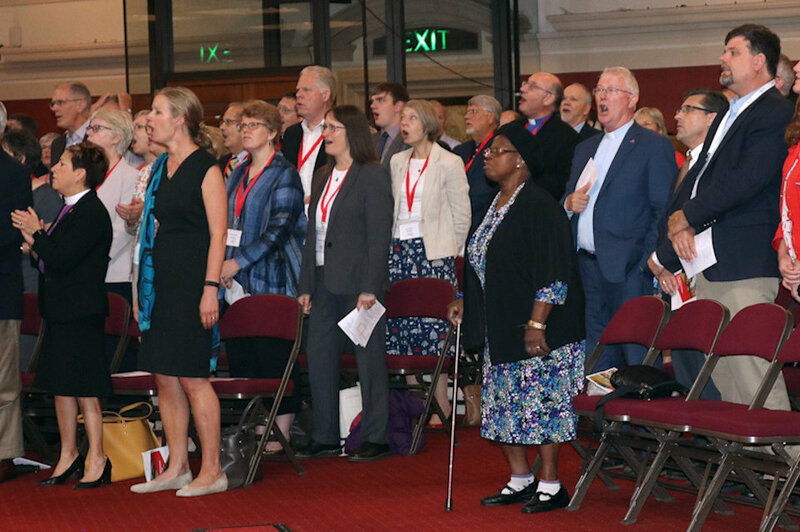 Two sister churches — The Methodist Church in Britain and The United Methodist Church– look to increase their global connection. The United Methodist Church was officially formed on April 23, 1968, with the unification of the Methodist Church and the Evangelical United Brethren Church. That same year, The United Methodist Church affirmed another relationship with the Methodist Church in Britain and entered an agreement called a concordat. The Rev. Jean Hawxhurst, an ecumenical staff officer for The United Methodist Church, explained that part of the agenda of the meeting during the celebration was to look at the concordat’s history and what was happening in the two sister churches at the time of its formation 50 years ago. The other part was to consider what can be done to improve the relationship and ministry and look at ideas that will increase the connection, she said. In his sermon during the opening worship, United Methodist Bishop Bruce R. Ough, episcopal leader of the Dakotas-Minnesota Area, challenged the church to proclaim the good news of Jesus Christ, being the servant without looking to be served. Ough described the world as filled with people drowning in loneliness, hurt, fear, hopelessness, doubt — people who are oppressed, hungry, homeless or being forced into slavery; people who are unemployed or do not have adequate health care or access to education; people who are sick or victims of abuse, war, greed and neglect. He reminded the gathering that the church already knows the truth of how to advance Christ’s mission, express vibrant living faith, proclaim the good news, restore desolate places and renew ruined cities. “Together, let us claim our identity, Mr. Wesley’s vision of Methodism as a preaching order in the church universal,” Ough said. Alison Judd, world president of the World Federation of Methodist and Uniting Church Women, led the litany of confessions, admitting that the two denominations did not support each other in order to become more effective in mission. Half-heartedly, each church kept focused on its own internal struggles instead of challenging one another to be present where action was needed, she said. United Methodist Bishop Cynthia Fierro Harvey, episcopal leader of the Louisiana Conference and president-elect of the denomination’s Council of Bishops, noted that a lot has happened in the past 50 years, showing that the two denominations have many similarities in strengths and challenges. In the closing sermon at the historic Methodist Central Hall, across from Westminster Abbey, Florida Area Bishop Kenneth H. Carter Jr, president of the Council of Bishops, urged the church to depend on God. 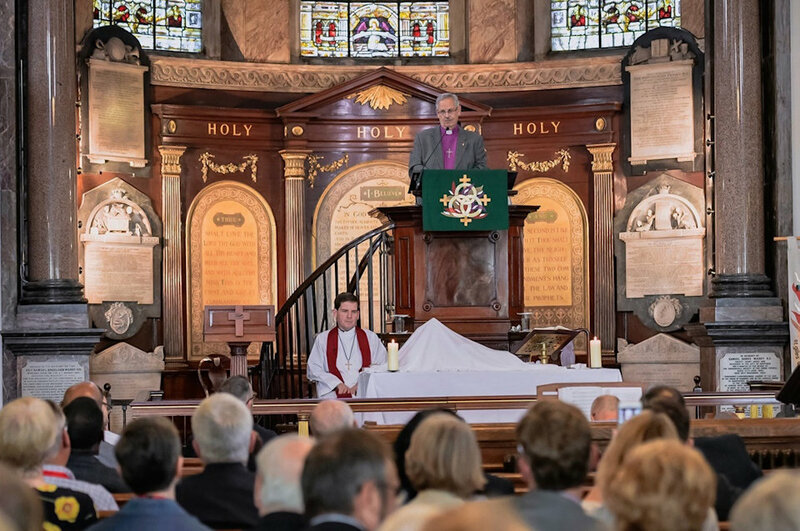 During the service, Powell, representing the British Church, and Bishop B. Michael Watson, ecumenical officer for The United Methodist Church, signed a statement of continued support of the concordat. Representatives of both denominations view their continuing relationship as an opportunity to promote true unity between Methodists in every part of the world. 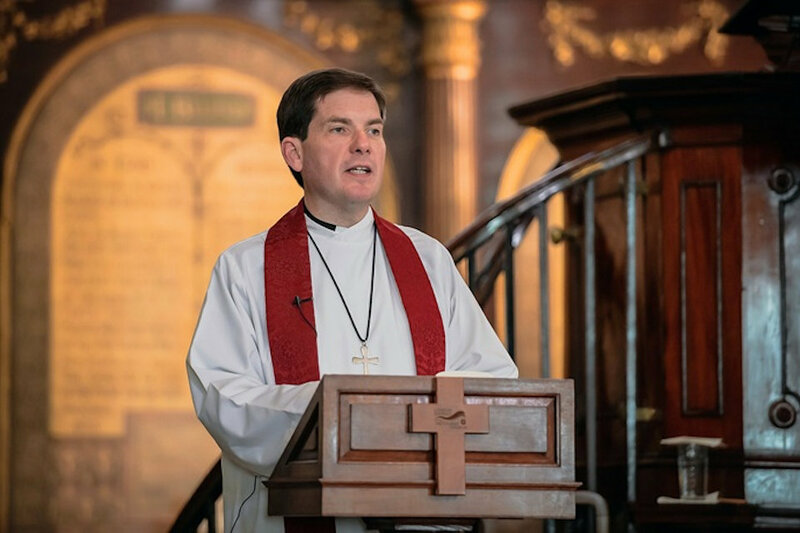 Watson said he believes that the concordat has caused the two churches to remain close and share the word in the manner that was learned from John and Charles Wesley. “This concordat has helped us to say we are one in Christ and Methodist people are one in all the world,” he said. The two churches sometimes approach similar issues in different ways. The United Methodist Church will have a special legislative session dealing with human sexuality and how the church will go forward together on that issue. The British Methodist Church also is engaged in discussion on human sexuality. “It practically helps us to talk with each other on these common issues as we look to the future to see where God is calling us,” Watson said. Delegates from both denominations heard several presentations about joint ministries and discussed possible future directions for the concordat during the weekend event. Thomas Kemper, top executive of the United Methodist Board of Global Ministries, explained that the denominations have joined forces to work more closely together in mission. It is expected that a small group with representatives from each denomination will be appointed by the end of this year. That group will create a renewed concordat for their conferences to affirm in 2020. Areas of focus for the renewed agreement will include looking at the purpose and faith statements in the original agreement, strengthening the common Wesleyan heritage and theology, increasing ministries together and working on justice and migration issues. The concordat agreement is moving from superficiality to substance, said the Rev. Alfred Day, the top executive of the United Methodist Commission on Archives and History. “We have committed ourselves to more substantial ways of addressing needs and shared experiences in our churches and across the globe,” he said.